The Queens County man who started a fire that grew to a late night inferno responsible for destroying multiple buildings in Bridgewater's downtown core still won't say publicly why he committed the crime. "I can't state that at this time," Adrian Thomas Hunt told Judge Paul Scovil during sentencing February 1. Scovil had just asked the 25 year old "the question probably on everyone's mind in the courtroom today:" Why did the Greenfield resident ignite pieces of paper and toss them around inside Geeky Robar's Computers on the night of October 22, 2017. After the response, Scovil asked again, "Why not?" Hunt answered, "It's something me and you would have to talk in private for and off the record." "So, you're refusing to answer?" replied the judge. In an agreed statement of facts, Hunt, identified by numerous tipsters after the Bridgewater Police Service publicly released footage from a closed caption television camera, "has not provided any explanation as to why he started the fire" and "would not respond" when he was asked "if anyone put him up to it ...."
Scovil endorsed the suggestion for Hunt's punishment put forward by both Crown attorney Janice Rea and defence lawyer Bob Chipman and sentenced him to five years in federal prison. Hunt is also subject to a lifetime firearms prohibition and ordered to submit a DNA sample to the national databank. "I'm truly sorry for what I did and If I could I would take it back in heartbeat," Hunt told court when he was asked if he had anything to say. He pleaded guilty in November to arson; accepting responsibility for intentionally causing fire damage to a King Street building while being reckless as to whether the property was inhabited or occupied. The maximum available sentence is life in prison; there is no minimum. In her submissions to the court, Rea said Hunt's lack of explanation makes it impossible to measure any risk of his potential to re-offend. Chipman called the absence of an explanation "an unsettling factor." Apartments belonging to George Crews, Liana Druin and Madelyn Myers were destroyed in the blaze. Crews, 56 years old at the time, moved to Bridgewater from Fort McMurray, Alberta after the wildfires there only to lose everything again in a fire here. He wasn't home at the time of the fire and was not insured. No restitution claim has been filed in his matter. Myers, 71 at the time, had tenant's insurance. She was in bed when the fire started and got up after she smelled smoke. She left her apartment going down the steps to King Street. No restitution is sought in her case. Victim impact statements were filed with the court. Rea read a sampling, such as Druin's which included an image of her pet cats. Druin described losing feelings of safety and independence, in addition to things that used to bring her happiness. "Emotionally this is my breaking point," she wrote, "and I wonder if I will ever get back to the person I used to be." Hunt was called out by the judge for the harm and danger he caused. "You were completely unconcerned with the lives of those people that you knew were there when you set that fire; that is one of most aggravating features that I find in this crime," Scovil said. "It is one that concerns me in these circumstances; that you would simply abandon any thought of what you were doing in relation to who might be hurt ...."
Scovil addressed impacts on the business community. "You struck at the heart of that downtown core when you burned those buildings," he said. "It suffered a setback that may or may not be replaced but certainly didn't progress Bridgewater anywhere to maintaining a downtown area." Businesses destroyed were: Big Daddy's Liquidation, Geeky Robar's Computers (which was located within Big Daddy's Liquidation), GreenWay Wellness Centre, Artistic Issues Tattoo Shop, Roger's World of Wireless, K.W. Select Realty and Vivid Graphic Design and Apparel. The lot where the inferno burned still remains empty after fire debris was removed from the site. Insurance firms retained by property ownership, collectively, claimed losses over $1.4 million and are requesting restitution. The Town of Bridgewater is also requesting over $11,000 in reimbursement. Scovil ruled no restitution would be ordered in the case. Being mindful of potential rehabilitation, associated case law, and given Hunt's background, Scovil suggested saddling Hunt with the debt may not allow him a chance to earn a livelihood after he's released. When Hunt is in a position to make money, Scovil indicated, it could afford the ability for impacted parties to recover losses using an alternate legal route. 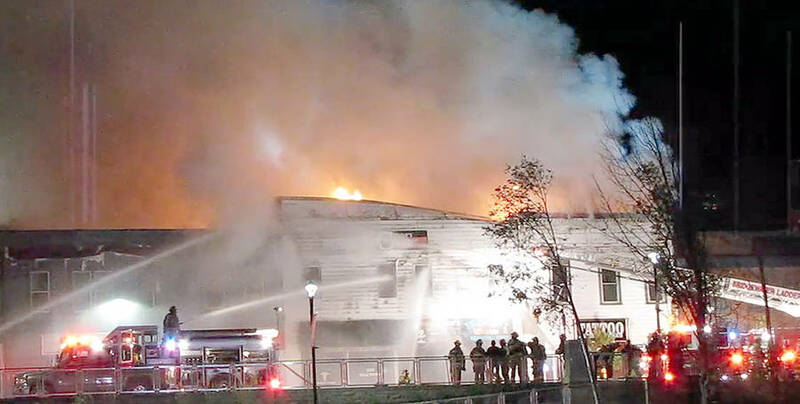 The Bridgewater volunteer fire department was summoned around 10:30 p.m. on October 22, 2017 to King Street, near the Old Bridge Street intersection, where the blaze had already engulfed one building and eventually spread to adjoining buildings on the block. The fire also gutted three apartments on the upper levels of two buildings. Police later obtained the video footage, which showed a man entering Big Daddy's Liquidation immediately prior to the fire and leaving again before smoke is seen billowing out of the front entrance. Authorities released a snippet of the video on December 18, 2017, showing the suspect walking on a King Street sidewalk. Hunt was identified by "numerous people." After his arrest on January 31, 2018, Hunt initially told law enforcement "he walked by and saw the fire through a window but he did not call police because he was scared he would be blamed." Hunt said he believed the next person on the scene would call for help. He went on to say he didn't think about the people living in the upstairs apartments, later admitting "he did a terrible thing" and "the fire got out of hand." A charge of break-and-enter with intent to commit an indictable offence was dismissed following sentencing.